You want real history? Travel to ocean level inside Hawaii Volcanoes National Park via Chain of Craters Road. Take Chain of Craters Road from 4,000 feet to sea level. At sea level, these authentic Hawaiian carvings abound. 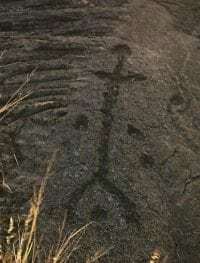 Look for the petroglyph road sign. Near the sign is an easy hiking trail leading to a boardwalk. The boardwalk tours the petroglyph area. How many different carvings can you see? After entering Hawaii Volcanoes National Park, turn down Chain of Craters Road, continue until sea-level, and park at the petroglyph sign.